What are New Zealanders like? Life in New Zealand is an exciting blend of Western-style city living and laidback rural and island culture. New Zealand boasts a rich mix of cultures, including Māori, Pakeha (European descent), Asian and Pacific peoples. It’s been called the “working man’s paradise” (and these days it’s a working woman’s paradise too) – because whatever your income, and wherever you live, you can enjoy all that this beautiful country has to offer. With its temperate climate and stunning scenery, New Zealand offers an abundance of sun, sea, snow and sophistication. Wherever you live in New Zealand, you’re likely to be less than an hour from the ocean, less than half an hour from wide open countryside and less than four hours from a ski field. And with only around four and a half million people living on a land mass slightly larger than the entire United Kingdom, there’s plenty of room. Urban attractions including big-city shopping, theatre, music and New Zealand’s famous cafe culture are contrasted by endless accessible beaches, almost-empty mountain slopes and relaxed rural lifestyles. New Zealand poet Thomas Bracken first coined the phrase “God’s own country” in the 1880s – more than a century on, the label has stuck, though these days proud New Zealanders (“Kiwis”) refer to their homeland as “Godzone”. New Zealand has also been called “one giant golf course” – not just because it has many affordable golf courses but because of its plentiful green open spaces. New Zealand summers last from December to March with winter from June to August. The climate is generally mild with few extremes in temperature. In New Zealand, freedom of speech, thought and religion are at the foundation of a modern, secular, democratic society with no class system. As people, New Zealanders value teamwork and giving people a “fair go”. Everyone is equal under the law, and New Zealanders are generally tolerant of difference and do not judge people on the colour of their skin or how they vote, pray or live. New Zealand was the first nation to grant women the right to vote and has a strong trade union tradition. The indigenous Māori make up around 14 percent of the population of Aotearoa (New Zealand), and their rich culture permeates all aspects of New Zealand society: from the pōwhiri (or welcoming ceremony) used to welcome visitors to all kinds of events, to the famous haka performed by the All Blacks at the beginning of every rugby test match. Perhaps the most common way you’ll hear New Zealanders described by people from other countries is “friendly and welcoming”. Kiwis love meeting people from overseas, and enjoy nothing more than casual socialising with friends and family – whether it’s having a barbecue, watching a rugby match on TV together, spending a day at the beach together, or enjoying one of the many other outdoor pursuits on offer. It’s the quality of life in New Zealand that attracts many new migrants. New Zealand is a generally law-abiding society where crime rates are relatively low and where the police don’t carry guns. Corruption is virtually unheard of. In some areas you’ll even still see the occasional roadside fruit and vegetable stall with an “honesty box” – these are for you to leave the correct amount of money for the produce you take! New Zealand’s “clean green” image reflects our great fortune in having avoided much of the pollution, congestion, health issues and cramped city living conditions experienced in many other countries. Like the rest of the world, we’re still grappling with how to meet the challenges of environmental problems like global warming. But we’re privileged that our relatively small population, coupled with our healthy respect for nature, enables us all to enjoy this beautiful country without inflicting significant degradation of the landscape. Most migrants find New Zealand offers a better balance between cost of living and lifestyle than they had before. The cost of housing is more reasonable than in many parts of Asia, Europe and North America. Two-thirds of New Zealanders own their own home, with 85 percent living a suburban lifestyle, although inner-city apartments and semi-rural living are becoming more popular. Higher house prices in Auckland and Wellington are tempting an increasing number of house-buyers to move to smaller towns and South Island cities where prices tend to be lower. Many people choose to rent their first home in New Zealand before buying. This can be a good way to get to know an area and decide if it’s where you want to settle. The ENZ New Zealand Immigration Guide offers helpful advice on renting in New Zealand, including a list of indicative rental prices in different areas around New Zealand. Organised migration to New Zealand only began in the mid-1800’s. Māori have been living in Aotearoa (a Māori name for New Zealand) for a millennium. Today, anyone migrating to New Zealand needs to be aware of the very special and central place that indigenous Māori culture, values and history hold in this country. Our indigenous people serve to remind all of us who live in Aotearoa New Zealand that we are guardians of the land – or “kaitiaki” in Māori. Connection to the land is possibly the most fundamental aspect of Māori culture and identity. Even the way in which Māori identify themselves is inextricably linked to the land. When Māori introduce themselves in a formal setting, they will refer to the mountains, the rivers and other landmarks of their ancestral home. This is not done with a sense of ownership – but rather with a sense of a spiritual connection with the land, tied in with a connection to the past and to those who have gone before. Sadly, the history of colonisation in New Zealand has been a history of alienation of Māori from their land. Despite signing the Treaty of Waitangi in 1840 with local chiefs – a move partly aimed at protecting Māori from unscrupulous settlers who were trying to cheat them out of their land – the colonial Government proceeded to bow to pressure from those same settlers over the next 100 years, progressively alienating Māori from their land through a long line of dubious policies and in some cases outright dishonesty. The situation for Māori worsened with the profound changes that occurred during the 1950s, when the New Zealand Government began actively encouraging Māori away from their rural homes to urban centres in order to support economic growth. At the beginning of the 1950s, roughly 80 per cent of Māori lived in their ancestral rural areas and just 20 per cent lived in towns. by the 1970s, these numbers had reversed. Then, during the massive state sector reforms of the 1980s, the Government privatised many major state assets including forestry, railways and mines – areas that employed large numbers of Māori – resulting in huge job losses. For Māori, this combination of urban drift and subsequent job losses resulted in them becoming disproportionately represented in negative employment, health and education statistics, and – consequently – over-representation in crime statistics. In the late 1960s and 1970s, the Treaty of Waitangi became the focus of a strong Māori protest movement which called on the Crown to “honour the treaty”. The 1980s then saw a profound renaissance of all things Māori – including the language and the culture. During the 1990s New Zealand governments engaged in a process to settle those historical grievances and provide some sort of compensation for the economic loss that Māori tribes had suffered. Over time, what has been a difficult relationship between Māori and the Government has evolved into something that now promises much more. Successive generations of New Zealanders are slowly developing a greater appreciation of some of the values our Māori compatriots have held for hundreds of years – that this beautiful land we live in “owns us”, rather than the converse – and that sustainable, sensitive custody of our land is critical to our sense of wellbeing. That’s something you’ll come to appreciate about New Zealand as you spend more time here. Around 87% of New Zealand’s population live in urban areas. A third of the population lives in the Auckland area, while a surprising 77% of New Zealanders inhabit the North Island. With just 1.5 million residents, Auckland – New Zealand’s largest city – probably sounds small to those of you who come from massive metropolises. But this vibrant, leafy city boasts all the attractions of a large, bustling cosmopolitan centre, without the usual downsides of overcrowding and pollution. 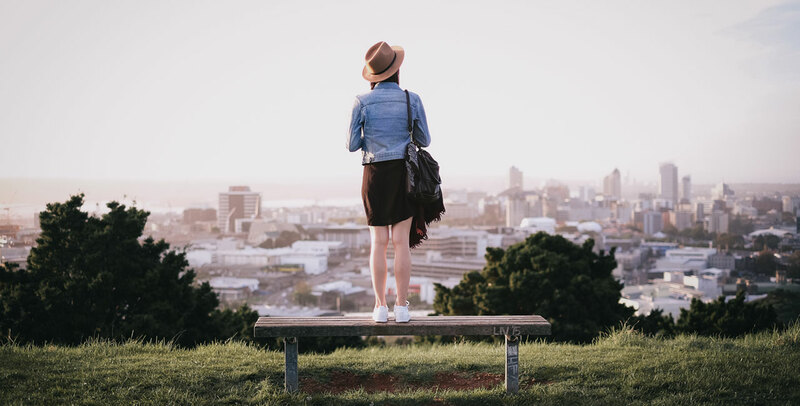 Surrounded by countless spectacular beaches, Auckland is consistently ranked amongst the highest in terms of best quality of life in the world by Mercer’s Quality of Living Survey. This annual survey compares hundreds of cities based on a wide range of criteria including safety, education, hygiene, healthcare, culture, environment, recreation, political-economic stability and public transportation. New Zealand’s other main centres – Wellington (the capital city), Christchurch and Dunedin – also offer wonderful urban living on a smaller scale, and each has its own special and unique character. As well as being the seat of Government and the banking sector, Wellington (or “Wellywood” as it’s affectionately nicknamed) is the centre of New Zealand’s flourishing film industry, most famous for producing Lord of the Rings and King Kong director Peter Jackson and his Weta Workshop. Wellington was not far behind Auckland on the latest Mercer’s Quality of Living Survey and is rated as having the twelfth best quality of life in the world among the world’s cities. Wellingtonians claim that their city is the “cultural capital” of New Zealand, and with their many theatres, art galleries and the wonderful Museum of New Zealand Te Papa Tongarewa – as well as a full calendar of arts and cultural events including international arts and film festivals, Readers and Writers Week and hugely popular summer carnivals and music festivals – it’s hard to argue with them. Christchurch is named the “Garden City” for its expansive public gardens and famous flower shows, and these along with its colonial heritage buildings lend it a very English air. This city of around 350,000 people is within easy driving distance of some of New Zealand’s most spectacular scenery – from the national parks of Aoraki Mt Cook and Arthur’s Pass, to Lake Tekapo and the spas of Hanmer Springs. You also don’t have to travel far to find world-class ski slopes or go whale watching – or you might prefer to stay and enjoy Christchurch’s vibrant Arts Centre, with its galleries, specialty shops, theatre, art house cinemas, bars, restaurants and bustling Friday Farmers’ Market. Dunedin’s proud Scottish heritage is visible in her historic architecture, including her university – the largest in New Zealand – which attracts students from all over the country with its international reputation and exciting student culture. Dunedin is renowned for its fashion, art, theatre and music scene, as well as being surrounded by some incredible wildlife – the world’s rarest penguins, a mainland albatross colony, fur seals and sea lions. For those who prefer a simpler life, it’s possible to live rurally in New Zealand and still be less than an hour’s drive from any of the main cities. While the effects of the global economic slowdown have been felt by all including the farming sector, dairy farmers continue to enjoy the benefits of very high export prices for dairy products. The New Zealand-owned farming cooperative Fonterra is the world’s largest dairy exporter, accounting for about 40 percent of the global trade in butter, milk powder and cheese and selling billions of dollars of product a year in around 150 countries. Agricultural products (including meat and wool) account for more than half of New Zealand’s exports, with dairy products making up around 21 percent. However, industries such as forestry, horticulture, fishing and tourism have become increasingly significant to the economy, and to the revitalisation of many small New Zealand towns. These towns are often vibrant and offer a cheaper, gentler way of life where you can enjoy the benefits of living in a close community and having easy access to the great outdoors. For those of you with children, Government-funded schools provide a largely free, secular education for all New Zealand residents. New Zealand’s education system is highly regarded and attracts many international fee-paying students. New Zealand has a 99% literacy rate. Approximately 60% percent of secondary school students go on to study some form of tertiary education, while approximately 80% of New Zealanders aged 15 and over have some form of formal qualification. Sport is a New Zealand obsession, and many schools have their own playing fields, gymnasiums and swimming pools. For parents with children aged five years or younger there is a wide range of education and care options available, from teacher-led centres providing fulltime or part-time care, to parent-led services and at-home care. The Government provides 20 hours per week of free early childhood education for all children aged between three and five. For older students, New Zealand’s tertiary (higher) education system includes universities, polytechnics, colleges of education and private training establishments. It offers world-class facilities, resources and teaching staff, and New Zealand qualifications are recognised and respected throughout the world. For international students, a personalised approach ensures that their needs are met and their interests protected beyond the classroom. New Zealand was the first country to adopt a code of practice that sets out standards for the care of international students, in and out of the classroom. All institutions that host international students have staff dedicated to ensuring their time in New Zealand is happy and successful. For those who want to improve their English, most tertiary institutions and some community organisations offer free courses to new migrant permanent residents and New Zealand citizens. There are also a number of private language schools around the country. New Zealand’s healthcare system is largely publicly funded, with many treatments free or subsidised. To be eligible for free healthcare, you need to be a New Zealand citizen, a New Zealand resident, the holder of a two-year work visa, a refugee, or a child under 18 years who is being legally adopted by a New Zealand resident or citizen. Private healthcare is also available. It’s one thing knowing how much you might expect to get paid in New Zealand. But will you be able to survive on that pay packet? Fortunately, New Zealand’s cities do not feature in the recent Mercers list of the world’s 50 most expensive big cities (2017). Ranked down the global list at 61st place, Auckland is New Zealand’s most expensive city, while our capital city Wellington is 86th place. The ENZ New Zealand Immigration Guide website provides lists of average house prices for different suburbs and towns throughout New Zealand, together with useful information on buying a house and a migrant’s guide to getting a mortgage in New Zealand. It also gives an idea of what you might expect to pay for things like food, clothing, telephone, travel, insurance and so on. The cost of renting or buying a house or a flat (apartment) in New Zealand will always be considerably higher in cities than in small towns or rural areas, and the North Island is generally more expensive than the South. As at 31 July 2018, according to the Department of Building and Housing, a typical two-bedroom flat in the working class Auckland suburb of Mt Roskill cost on average $450 a week to rent, while a 3-bedroom house cost $560. At the top end of the market, in the exclusive inner-city beachside suburb of Auckland’s Herne Bay you’d expect to pay $630 for a two-bedroom flat, and $1,000 for a three-bedroom house. In the Wellington region, a two-bedroom flat in the suburb of Johsonville, a 15 minute drive from the city, will cost on average $405 a week, with a three-bedroom house costing $545; while a two-bedroom flat in the leafy, high-income suburb of Khandallah, just 10 minutes’ drive from the CBD, will cost $450, and a three-bedroom house will cost $595 a week. Meanwhile in the South Island of New Zealand, a two-bedroom flat in a lower-income suburb in Christchurch will cost around $300 a week, a three-bedroom house $400, while the same accommodation in the exclusive Christchurch suburb of Fendalton will cost $360 and $450 respectively. The Department of Building and Housing has a useful, regularly-updated list of typical rental prices for houses and apartments throughout New Zealand. “Working for Families” is a system of tax credits designed to help those who are working and raising a family, on low to average incomes. New Zealand residents with dependent children aged 18 or younger (or any migrant with a child who has been granted permanent residence status) may be eligible depending on their income, hours worked and the number and age of their children. You do not have to have lived in New Zealand for any set time before you make a claim. Under the Working for Families system, an income-tested Accommodation Supplement is also available, and some families will be eligible for childcare subsidies. For a comprehensive list of the different types of Government support available, click here.